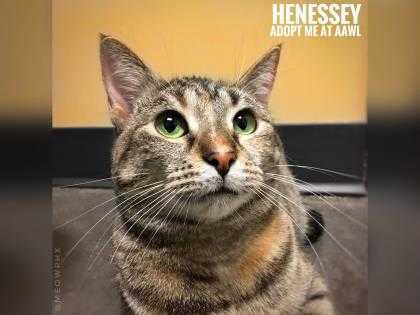 Hey there, I'm Henessey!I'm a sweet little lady waiting patiently to find my forever home! I'm friendly, cheerful, active and very sweet! I love to be pet, give head bumps, and play all day! Batting around a toy mouse and chasing around wand toys are games that I find the most fun! I'm also quite the talker and love to have conversations with people! I sometimes get spooked by loud noises and fast movements so a calm household would be best for me. I also need a home without any dogs or young children. If I sound like the purrfect girl for you, come down to the main shelter to meet me! ***My adoption fee is sponsored by Petco!! Come see me and my adoptable friends at AAWL's Sonia Breslow Adoption center!25 North 40th StreetPhoenix, AZ 85034Questions about me? Contact our shelter at 602-273-6852 ext. 103.